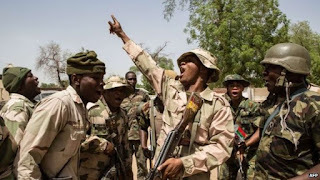 Troops in Borno State have rescued a female child abandoned by fleeing Boko Haram terrorists, the army spokesman, Brig.-Gen Texas Chukwu, said on Monday. Chukwu said in a statement the troops on a “clearance operation” also recovered three AK47 riffle magazines, one FN rifle magazine and one suicide vest from the terrorists. “Other items recovered from the insurgents include one dry cell battery, one 36 hand grenade, two nine volt batteries, one pressure plate, wire for making Improvised Explosive Devices (IEDs) and two grinding machines,” he stated.